New! My RANS S-10 is for sale! The RANS S-10 Sakota is a two-place fully aerobatic monoplane, capable of intermediate level aerobatics. It is powered by a 65 hp Rotax 582, which is a two-cylinder water-cooled two-stroke engine. With its very light engine, my S-10 weighed only 475 pounds empty, and had a gross weight of 875 pounds. It is a very small airplane but reasonably roomy inside, with an ample baggage compartment. 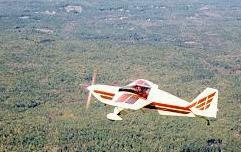 The S-10 is a delight to fly and to do aerobatics in when the air is calm. 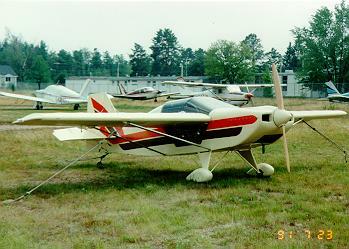 Its controls are light (except for the ailerons, which are rather heavy) and its responses in pitch and roll are significantly faster than the Pitts. Loops and rolls are easy, and hammerheads are a piece of cake, far easier than in my Pitts (although you must remember to hammerhead to the right because the engine turns counter-clockwise). The rudder is the best control; it is light, powerful, precise, and linear. The S-10 is quite high workload when the air is active. Its light weight and low wing loading combine with aerodynamically divergent static stability to give flight dynamics similar to a helicopter. Every puff of air disturbs it from level flight, and the pilot must actively return it to level flight with control inputs. On a normal summer day, with typical convective bumpiness, I counted approximately 60 control inputs per minute! The instability makes the S-10 a tiring airplane to travel in. 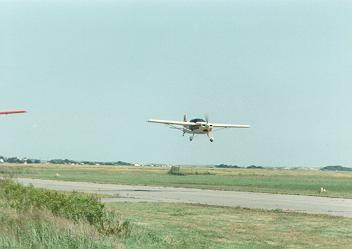 In addition, on cross-country trips, the pilot must constantly keep an eye out for a landing field in case the engine quit. I followed interstates when I could, so that I could land on the median if necessary. Landing the S-10 is easy; the relatively low landing speed and excellent control authority make it delightful, especially on grass. I built my S-10 over the course of 3 1/2 years, starting in February 1988 and completing it in July of 1991. She first flew on July 21 of that year, and flew for over 3 years, accumulating 260 hours during her short life. "Little Tiger", as I nicknamed her, was my pride and joy. She took almost 2000 hours and much dedication and creativity to build, and gave me tremendous joy and satisfaction (and not a little frustration) throughout the building process as well as all during her flying life. Sadly, she was destroyed on October 15, 1994, when the engine failed on takeoff. I turned around to return to the airport but we crashed into trees just before reaching the end of the runway. 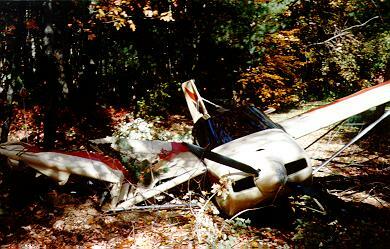 Fortunately, I and my passenger walked away, but Little Tiger's right wing, tail, and landing gear were crushed. I am convinced that Little Tiger's stout welded steel fuselage saved our lives. Some rough analysis shows that the angle and velocity of impact should have resulted in a fatal crash. However, the steel fuselage was largely intact, except for some deformation at the wing attach points and some twisting of the tail. The passenger compartment was totally intact, which resulted in minimal injury to us. The fuselage was bent badly enough that complete disassembly was necessary to weld in some major structural members. Currently the S-10 awaits a change in circumstances in my life that will allow me to begin the reconstruction process. For more details on the life and times of my Little Tiger, read Building and Flying a RANS S-10 (30kb), A Midsummer Adventure (17kb), and My First Aerobatic Competition (24 kb). For a poignant story about the crash, read The Death of a Dream (11 kb). If you're a real glutton for technical details, see Aftermath: The Report to the FAA (20 kb). See my gallery of S-10 Photos for lots more pictures.